With the expansion of blockchain technology, we imagine a world where every product can be traced along its journey, providing complete supply chain transparency. Can you imagine a future where every physical product has a digital story to prove its origins, its ownership and its characteristics? Where for every product complete transparency, authenticity and verified quality is guaranteed? A world where you know exactly what you are eating, where your clothes have come from and the history of everything you own. Times are changing. Consumers want to make ethical choices; choices that ensure no human rights have been violated, choices that minimise their impact on the environment and choices that ensure animal welfare. 2010 – Major Sweatshop Scandal where Indian workers were being paid just 25p an hour and being forced to work overtime. Major retailers such as M&S, Next and GAP launched their own investigations. 2013 – Horsemeat Scandal where horse DNA was discovered in frozen “beef” patties in Britain and Ireland, raising questions on supply chain traceability and bringing the issue of food fraud to public attention. 2017 – Chicken Safety Scandal where 2 Sisters Food Group were found to be contravening food safety and hygiene standards, predominantly impacting the retailers M&S and Aldi. There is growing demand from consumers calling for more transparency from brands, manufacturers, and producers throughout the supply chain. How many more have gone under the radar away from the media spotlight? Focussing on food and the inevitable Brexit link! Food fraud is a continuing problem, upon which much time and effort across Europe is expended. A no-deal Brexit is going to be interesting to say the least! It is unclear if the UK will continue to have access to the EU Rapid Alert System for Food & Feed database or be able to contribute to it. It is also unclear if the UK will continue to have access to the data held by the European Food Safety Authority. A terrifying thought and a backwards step in transparency and data sharing! Eight out of ten consumers want to know where their food has come from. As they tuck into their delicious Sunday lunch of roast beef and Yorkshire pudding, they want to know exactly what has happened to that piece of beef, from the point at which the cow was born to it ending up on their plate. So isn’t this already possible? Cows already have passports and there is plenty of information on the packaging of products that give us information such as the abattoir that slaughtered the cow, the country of birth, the country of rearing, where it was processed - so this data must be recorded and traceability must be guaranteed? Well maybe, but in centralised systems which are largely rudimentary, inherently difficult to verify and are commissioned by neutral, not-for profit or governmental entities in order for the data to be ‘trusted.’ Can one organization really be trusted to broker all data about every product’s supply chain? Surely such an organisation would leave itself vulnerable to corruption, extortion and fraudulent behaviour. So, how do you counteract this? Find a way in which data-sharing can happen between disparate participants in the supply chain and be trusted. What is it? Good question! It’s being described as the next biggest economic revolution the world has seen since the internet….a huge billing and one that excites the technologists amongst us. Simply put it is a ledger that holds transactions, but rather than all of the records being held centrally in one place, they are distributed across different computers. Hence it also being referred to as DLT (Distributed Ledger Technology). The transactions are the ‘blocks’ and the relationship between the blocks based on timestamps chain them together; allowing you to trace back to the originating ‘block’ and ensuring little chance of tampering or fraud because there are multiple copies where each amendment must be independently verified. The distributed nature of the blockchain removes the need for a central organisation to maintain the system. It is a shared and secure platform which allows a participant to inspect an uninterrupted chain of custody from the raw materials to the end product. It gives an unprecedented level of certainty over the fidelity of the information as, by design, every transaction along a supply chain on the blockchain is fully auditable and for information to enter the chain it has to be fully authenticated through digital cryptography. 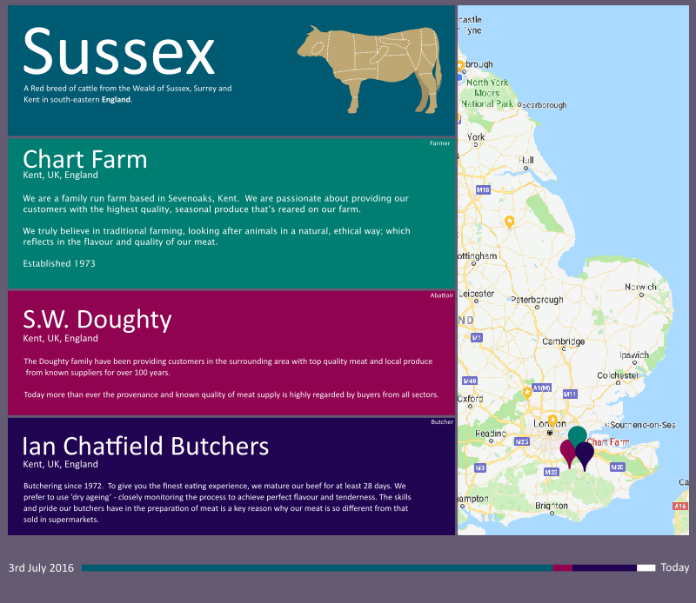 Imagine a ‘beef chain’ – a blockchain where every participant of the supply chain from the farmer to slaughterhouse, to the vet, to the retailer shares their data; thereby allowing a consumer to know exactly what the cow was fed, its parentage, its age, its environment, its health, how and where it was slaughtered, how and where it was processed and the time that has passed from field to plate. It relies on all parts of the supply chain to be technologically advanced enough to enter their part of the data to the blockchain, thereby enabling the responsibility for trust to be distributed along the supply chain. How realistic that is remains to be seen but if successful will provide complete transparency for the consumer allowing them to understand and appreciate where their food has come from and giving them peace of mind about the supply chain. It is still necessary to link the digital representation of the product to the physical one. There are lots of different technology solutions (RFID, NFC and QR codes) which can be used to tag physical products to link them to the digital information. Whilst this works to a degree for non-consumables, it is much harder for consumables. It is a weak link where trust in the supply chain cannot be 100% guaranteed as there is a reliance on the honesty and accuracy of the participants to ensure that the link between the physical product and the digital product is correct. So whilst Blockchain provides an excellent solution to ensuring the digital information captured is accurate, authentic and auditable, how this information links back to the physical product is still a vulnerability. Who knows what might be possible in the future – DNA data? By design, Blockchain allows the tracing of the history of products. It forces complete transparency, guarantees authenticity (as long as that pesky digital to physical link can be sorted!) and provides complete auditability thereby providing a secure, undisputed source of incorruptible information. Consumers can be provided with the information they need to allow them to make smarter choices and drive the market demand for particular types of products with particular characteristics – this is likely to drive (positive) changes throughout the supply chain as each of the participants will be made more accountable for their business practices. Simon Bennett describes the role of the NIS Directive in protecting critical services from cyber threats. Can you afford to ignore this critical part of a modern IT estate?